Invalid Email Address. Correct and try again. 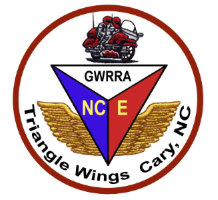 We are affiliated with the Gold Wing Road Riders Association (GWRRA), the world's largest single-marque social organization for owners and riders of Honda Gold Wing and Valkyrie motorcycles. Owners or riders of other brands or types of motorcycles, or those interested in motorcycling, are welcome to join us as Associate Members. Dedicated to our motto, Friends for Fun, Safety and Knowledge, GWRRA members enjoy the freedom of belonging to a not-for-profit, non-religious and non-political organization. For those of you wondering who we are and what we do, we hope your visit here will give you a little insight into our lives. Please feel free to view our continuously updated calendar for our scheduled rides. We would be pleased to have you join us for any of these or on the 3rd Tuesday of each month for our meeting at IHOP located at 1301 Kildaire Frm Rd, Cary NC 27511.Click here for a map.